The Famous Internet entrepreneur and former hacker Kim Dotcom, who introduced legendary Megaupload and MEGA file sharing services to the World, has came up with another crazy idea — To start his very own Internet that uses the "blockchain". Just last month, Kim Dotcom, a German millionaire formerly known as Kim Schmitz, launched the public beta of its end-to-end encrypted video and audio chat service called "MegaChat", which it says gives better protection than alternatives such as Skype and Google Hangouts. 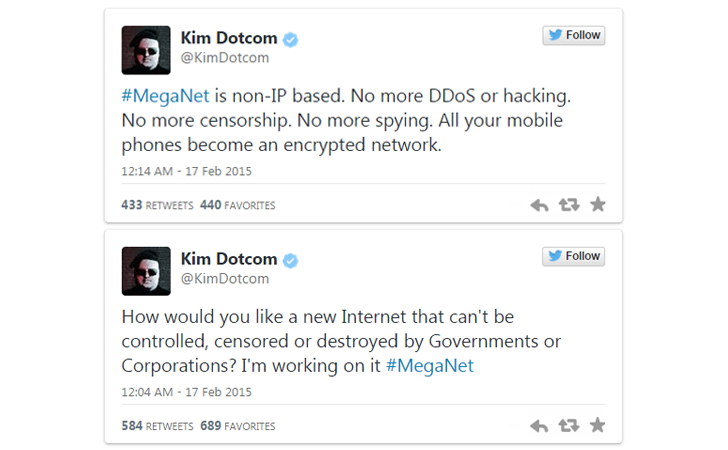 Now, his latest series of tweets referred to Kim Dotcom's supposed "MegaNet" which, he believes, would be immune to the global mass surveillance conducted by governments or corporations and would not be based on IP addresses. 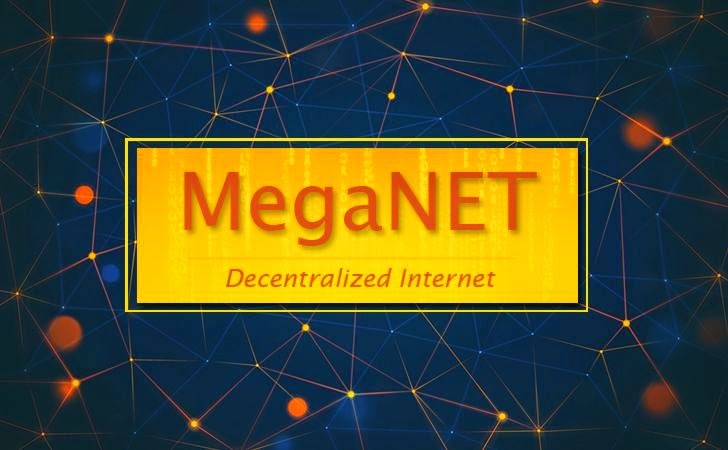 MegaNet would be a decentralized, non-IP based network in which the blockchain used by Bitcoin will play an "important role". Decentralizing the Internet means to take the power of the Web away from powerful hands of governments and corporations and put it back in the hands of online users. This move would offer users a truly free space, where they can communicate privately with anyone else without censorship. Mr. Dotcom continued to inform his followers that they "would be surprised" about "how much idle storage and bandwidth capacity mobile phones have", adding that "MegaNet will turn that idle capacity into a new network". Entrepreneur also assured its followers that the consumption of the battery won't be a problem for a large number of phones in the network carrying MegaNet. "MegaNet won't rely exclusively on mobile networks at launch. But the more powerful phones become the more data & traffic they will carry." There are a number of similar projects that lead to the change towards Decentralization. One such is by David Irvine, dubbed MaidSafe — Massive Array of Internet Disks - Secure Access For Everyone. Maidsafe is an open-source program (hosted on GitHub) that enables a decentralized Internet platform. The key part of MaidSafe is its SAFE network, powered by its participants' computers, which means, instead of specialized servers, data are stored and distributed by a network of internet-connected computers. Anyone running MaidSafe program will become part of the SAFE Network. The MaidSafe system turns all connected devices into SAFE Network nodes that collectively store data for all MaidSafe users. Data storage is automatically decentralized, which means a web application using MaidSafe does not store its user's data on any central server — rather the data is spread across many disks and devices owned and managed by many different MaidSafe users. Therefore, no one, whether it’s person or corporation, has an intact copy of a user's file. At the end of last year, BitTorrent announced Project Maelstrom which is "the first step toward a truly distributed web, one that does not rely on centralized servers." "Truly an Internet powered by people, one that lowers barriers and denies gatekeepers their grip on our future," said BitTorrent. "If we are successful, we believe this project has the potential to help address some of the most vexing problems facing the Internet today." According to BitTorrent, the distributed browser could help maintain a more neutral Internet. If an ISP can’t identify where traffic is originating from, then it can’t suppress certain sites accessed from a browser like Maelstrom. At the beginning of new year, a new open source project known as ZeroNet launched that aims to deliver a decentralized web platform using Bitcoin cryptography and the BitTorrent network. ZeroNet uses a combination of BitTorrent, a custom file server and a web based user interface to do so and manages to provide a pretty usable experience. The main goal of this project is to host websites and provide anonymity for each site’s owner.